Update: Jerry Hooten has been found safely. After becoming separated on the trail from his friend, he tried to walk to a trolley stop but was unfamiliar with the area and became lost. He called another friend yesterday morning, who heard of the search and notified the Sheriff. Deputies located him a short time later, walking home in the Lake Murray area. 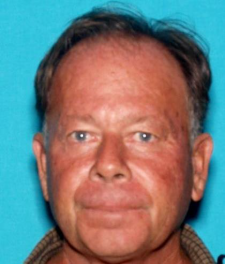 November 29, 2014 (Lakeside) – The Sheriff’s Department is asking help from the public to find Jerry Lee Hooten, who was last seen by a friend hiking toward the peak of El Capitan (El Cajon mountain) in Lakeside on Friday, November 28th around 3 p.m. He did not return to the vehicle he arrive at the mountain in and has not returned home. Lakeside deputies responded to the call for help at 12777 Wildcat Canyon Road in Lakeside. Hooten is 5 feet 9 inches tall with brown/gray hair. He was last seen wearing a gray T-shirt, blue jeans, gray shoes, and carrying a yellow backpack.